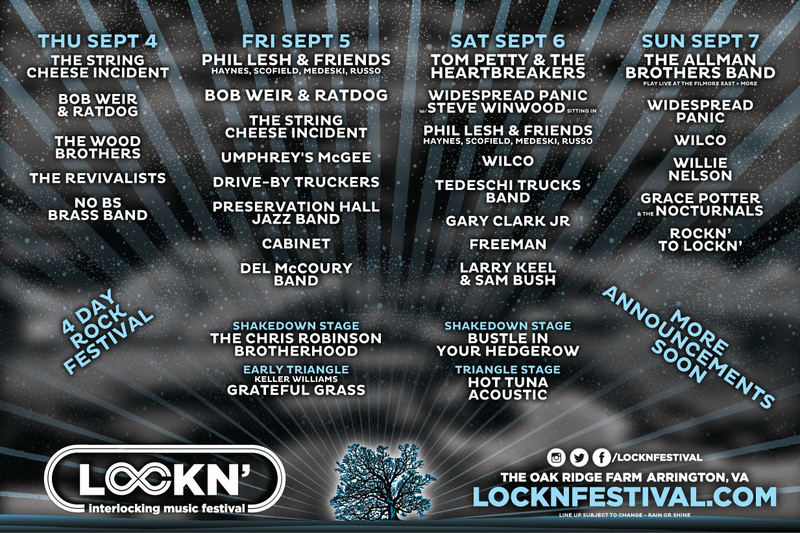 In just a few years, Lockn’ (formerly Interlocken) has established itself as one of the country’s prominent and downright most fun festivals. Sure, it’s crunchy as hell with bands like Phil Lesh, String Cheese Incident and noodley mainstays Panic on the bill, but wait … Tom Petty & The Heartbreakers! Preservation Hall Jazz Band! Willie Nelson. And, to boot Wilco will play their only festival of 2014 at the four-day musical bonanza. It’s all being held once again at Oak Ridge Farm from September 4 – 7. The farm is located at the foot of the Blue Ridge in Central Virginia, spitting distance from Charlottesville, Washington, DC, and Richmond, VA.
Lockn’ was named for traditions central to both festival founders Dave Frey and Peter Shapiro: The inter-locking performances presented at Wetlands and the continuous uninterrupted music featured between the two stages at HORDE. Lockn’s conceptual theme touches all elements of the event: “when something ends, another begins.” This simple yet powerful ethos of sustainability is consistently integrated into the camping, lodging, food, drink, transportation offerings as well as the specialized onsite activities all weekend long, making it one of the premiere events of the summer. For more info, check out the festival’s site.